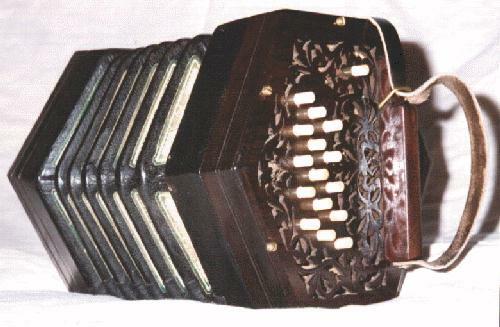 In contrast to the Wheatstone Anglo, this concertina dates back to about 1885. It was originally tuned to the keys of Bb/F, before being retuned by Colin Dipper to its present keys of G/D about 15 years ago. The G row is at the same octave as on a baritone C/G anglo, which makes it a very interesting instrument for song accompaniment. It is also well suited to English traditional music, less so if you want to achieve an "Irish" sound in your playing.